This is our new brand and high quality bathroom high cabinet which provide the perfect solution to your storage problems. The bathroom cabinet offers large storage capacity in a compact space so it can help you save space. It is ideal for bathroom, hallways, kitchens and beyond. Equipped with 5-shelf provide plenty of room to storage your items and a door with silver metal handle knob can keep your personal item safe and protect your items from the moisture in the bathroom. What’s more, it has movable shelves so that you can adjust the distance between layers according to your needs and the anti-dumping design can protect your safety. Don’t hesitate to buy one! 【Smart & Modern Design】A wonderful all-around pragmatic bathroom tower storage cabinets. It was consist of five open shelves and one cupboard with door, with plenty of storage space for you to arrange your towels, plants or cosmetics, also hide some personal or unseemly necessities like toilet paper and cleaning products. 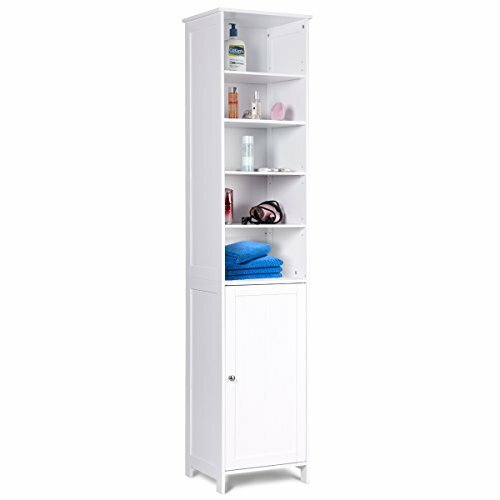 【Large Storage Capacity】The dimension of this bathroom tower storage cabinet is 16”X13.5”X72” (LXWXH). There are five shelves and one cupboard with door of this cabinet, which can provides an excellent storage space option for any kind of bathroom with restricted area. it can accommodate all your toiletries, such as cosmetics, shower gel, shampoo and towels, perfectly save space for your bathroom. 【Selected Material】Crafted by durable premium MDF material, it guarantees that you can use it for a long time. A environmental friendly paint to secure no harm to your family. What a perfect choice for your bathroom. 【Adjustable Shelves】This cabinet equipped with 4 adjustable shelves(one active shelf inside of the cupboard). you can adjust the size of the space flexibly according to the size of your item or your personal needs.